Aaaah… (accompanied by a small sigh at the end)…it all seems so long ago now. My epic journey started way back in the summer of 2014. I was sitting in my office which conveniently doubles as my ensuite, when the phone rang. I don’t usually have my phone with me in the office so the call actually caught me by surprise. This was handy as nothing much was happening at that point and the fright was exactly what I needed. It was Sandy Lonergan, good friend and media coordinator for Australian Ladies Professional Golf asking if I was on the bag again this year. This is secret code for “Am I caddying for Aussie Champ, Lindsey Wright in the Women’s NSW Open”. I had been so immersed in my new role as Australia’s oldest Assistant Professional at the beautiful Mount Broughton Golf and Country Club, I hadn’t given it much thought. Sure, the prospect of carrying 50 kilos of golf equipment around the hilly Oatlands course in the middle of a heat wave for 54 holes was appealing, however, as you can imagine, there were some issues I had to address before committing. For one, who would hose the carts down on Saturday morning? Then there was the matter of how Brooksey and I haven’t been beaten at Friday arvo lawn bowls for three straight weeks. As you know, when you get on a run like that, momentum means everything. After successfully finding someone at my club who knew a gurney wasn’t something you carry an Italian footballer off the field in, and grabbing a six pack of Tooheys Dry for Brooksey, it was off to Oatlands. Lindsey and I were a team again. It had been two years since Linds and I had teamed up but when a strong bond is forged under great pressure, it takes a whole lot to break it…. Plus the fact that her regular caddy couldn’t make it. We did the “It’s good to see you, kiss on the cheek” thing which was great until I realised Linds had a mouthful of sandwich and I could feel a piece of lettuce hanging off my face. I must say I was a little surprised when I saw she had replaced her lightweight stand bag for a 10 inch Volvic Tour job. You could have fitted, another 14 clubs plus Lydia Ko in this bad boy! Anyway, off went the three of us, (Lindsey, Larry and Volvic 10” tour), on our quest to add a NSW Open title to the former world number 12’s bulging trophy cabinet. We opened up with a series of straight forward pars followed by a couple of nice birdies and by the end of the day “We” had shot a 2 under par 72. Whilst it was a steady effort it wasn’t exactly riveting and I found myself wondering if Brooksey and I could have of won that fourth straight match. An hour and a half later we signed for a new course record 8 under 64 and I didn’t give a rats about Brooksey. Final round and we’re in the last group, tied for the lead at minus 10 with talented South Australian, Stephanie Na and the powerful Kristie Smith at 9 under. At this point I’m thinking to myself how good Lindsey Wright is as a player and for that matter, I must be able to caddy a bit. To be honest, I wasn’t sure if I could make the transition from “1980 something player” to “21st century caddy” given that when I was playing, the only yardage my caddy would carry in his back pocket was how far away from his parole office he was allowed to be. Unfortunately, Lindsey came out a little flat and despite a couple of early birdies, couldn’t quite repeat the birdie blitz of the previous day allowing the delightful French girl, Joanna Klatten who shot a brilliant 63, Nikki Campbell, England’s Hanna Burke and the sweet swinging Stephanie Na to slip by. None the less, two caddy gigs with Linds resulting in a 3rd and a 5th is not to be sneezed at. As you can imagine, word had now spread across the great oceans about my ability to caddy the ears off any tournament and it wasn’t going to be long before offers came flooding in. South Africa’s Lee Ann Pace had just finished a brilliant 2013 winning three times on the Ladies European Tour resulting in a second place finish on the money list behind World number two Suzann Pettersen. 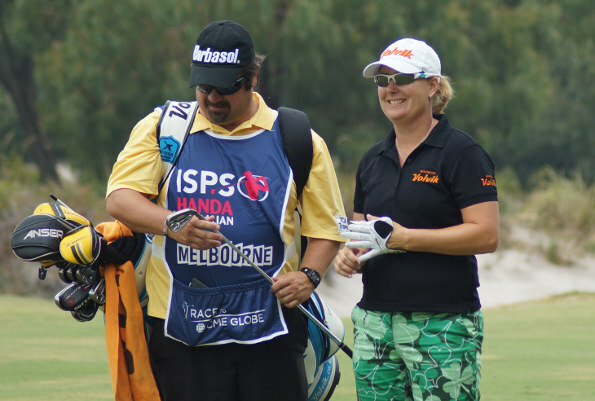 Obviously, Pace needed someone of my caddy creds to take her to the next level for the 2014 Women’s Australian Open so her people spoke to my Mum… sorry … people, and everything was in place. By now, I could feel my confidence waning and my love of lawn bowls at an all-time high. The final straw came on the last hole when I again missed Lee Ann’s bag, this time with her wedge. The good news was we found it… sometime later in her playing partner’s bag. That was the last time I saw Lee Ann Pace. My extraordinary journey was over and my burgeoning career as a professional caddy has finished up with me back on the gurney at Mount Broughton. What have I a learnt? “Lardy” is actually South African for “futile”. Also, that Brooksey is lost without me. Sure, he won our next match on his own, but he had to go the bar himself after each end. Who says I’m not good at carrying stuff. Lindsey Wright with a much more appropriate looking caddy in the opening round of the 2014 Women’s Australian Open. There is another, apparently much more accurate version of the Larry the Looper story. It goes like this: Lee Ann Pace is actually an extremely nice person. When her friend, who knows her game better than anyone, didn’t qualify for the Australian Open on the Monday, it was jointly decided the friend would be a much better option to caddy. The friend is even good at putting all the clubs back in the golf bag and not leaving any behind. Sounds like a good decision on Lee Ann’s part.